Small and creative group Pilates apparatus classes to fit your needs and goals. Personalized sessions in our state-of-the-art facility with our highly trained and passionate instructors. I love everything about this studio! Fantastic instructors that customize your workout to YOUR body, clean & serene studio environment, modern state-of-the-art equipment - and it's great fun! I've been a student for almost a year now and am stronger and more toned than I've ever been. 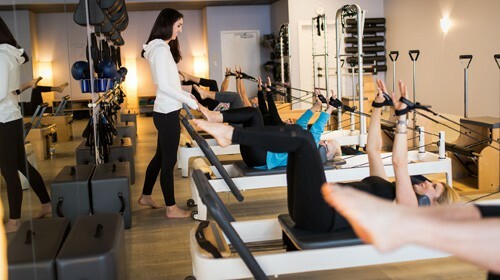 Do yourself a favor and try a reformer class today! This place is wonderful! I had my first lesson with Tresa, the owner. She is knowledgable, professional, and pleasant. I have some physical limitations and Tresa was able to quickly come up with helpful moves that have improved my comfort and mobility. The studio is beautiful and just has a great "vibe". The whole experience was very positive. Can't wait for my next lesson! I started going to Pure Movement Pilates about 2.5 years ago to improve my running and overall fitness through flexibility and strength on the recommendation of a friend. I haven’t regretted it. I have tried every type of class and love that there is the opportunity for every fitness level to get an appropriate and tailored class. I even had some assistance, through private lessons, recovering strength and flexibility after hip surgery a year ago. Every instructor I have worked with has been fantastic.